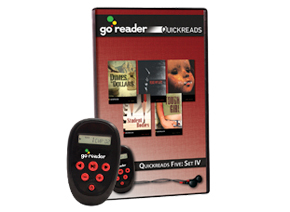 This GoReader™ comes preloaded with the audiobooks for 5 Quickreads titles: Dimes to Dollars, Read My Lips, Ruby’s Terrible Secret, Student Bodies, and Tough Girl. Dimes to Dollars: Some 100 years ago, a stagecoach was robbed of a fortune in newly minted dimes. The loot was never found. As a lark, two young campers decide to search for the robbers’ hidden treasure. But the excitement only begins when they find the dimes! Read My Lips: As if being deaf weren’t challenge enough, Lupe encounters rampant sexism while working on assignment with the police. She’s almost ready to throw in the towel! Then the cops need her talents as a lip-reader. She earns their respect by cracking a difficult case. Ruby’s Terrible Secret: Why did Melinda’s grandmother send her away so abruptly? Years later, while visiting the old homestead, she finds a clue in an old photo album. Melinda can’t believe her eyes. The little girl in the picture hasn’t changed a bit in the the last 50 years! Student Bodies: Something downright creepy is happening on campus. When Jake’s girlfriend, along with several other students mysteriously disappears, he does some research. Tough Girl: To Wesley Chan, Zoe is beautiful in spite of her messy hair, ragtag clothes and smart mouth. His parents disapprove of the relationship.